and have it open it. After using 'Split', are you then using Cdbl to convert to a float/double? As mentioned previously, just take my raw text (i.e. '2.4') and do a string replace on text, replacing the '.' with whatever the real decimal seperator is. Then the Cdbl function should work fine. If you don't want to use the API and don't already know of a better way, just use this code to find what the decimal seperator should be. You can call that at the start and you'll then know if you need to perform the string replace on every graph data line - because DecimalSeparator isn't '.'. In theory you can do it as a whole, replacing all the '.' (dots) in a given line rather than doing it value by value because they'll be the only ones present. Noticed that the debug version outputs a .txt file on the desktop. Not sure you need/want it, but I've attached it. @Cynthia - Thank you very much ! Your post about changing the 'Regional and Language Options' on your system pointed me in the right direction. Since you were able to get the program to work by changing your settings to "English(United States)" I thought I should be able to get it to fail if I changed my settings to "Swedish". (Duh!!) I was able to reproduce the error and since I was inside the VB IDE it took only seconds to find the problem. @LIGHTNING UK! - I use the 'Split' function to parse the CSV data into separate values and then 'Val' to convert the text into a double - or at least I should have been. I found I had not used 'Val" on some of my calculations. (Copy and paste error) Apparently the strings were being evaluated properly in the "English" environment but failed miserably when faced with an alternate reality. BTW - the "browse for file" is back in. I found an all API solution so no problems with a missing OCX. Yea ! @Everyone - I managed to reproduce the errors Cynthia and eSkRo were having by changing my language settings to Swedish and French. I believe I have corrected the issue. Please take some time and throw a few .ibg files at the new version (attached) to see if I have really solved the problem. 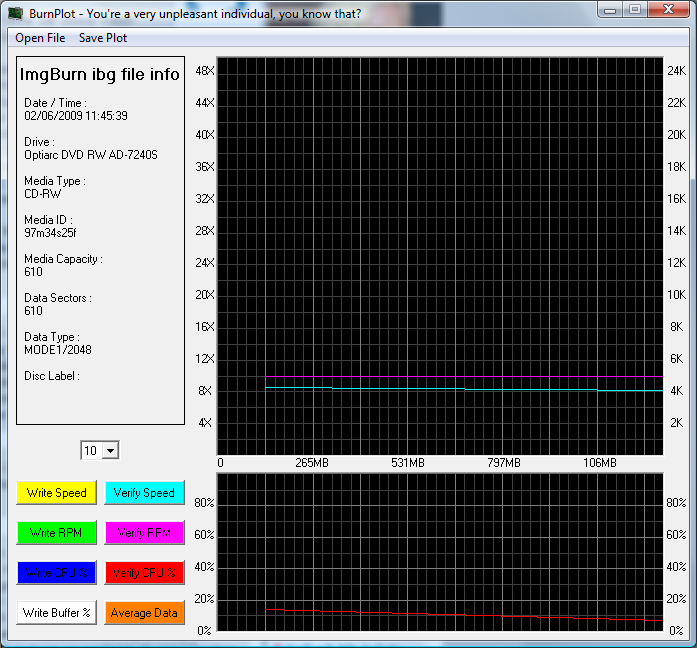 I forgot to mention, I have no idea how the RPM is calculated. Ask that same question in here and I'm sure someone will know/answer you. You might want to tweak the initial position of your window too, it doesn't work well with vista (Aero enabled) because 'Top' being 0 doesn't actually work on non-resizable windows (blame MS) and you end up cutting off about 4 of 5 pixels. Just bringing it up in the middle of the screen would do. For IBG's, can you set the x axis scale the same as DVDInfoPro? Your window should be sized so that it ends on a major vertical line - make room for 9 in total or something. If you can get it loading an IBG via a single (unicode) cli parameter, we can start using it properly in ImgBurn - and it'll make for easier testing. It won't load the attached IBG btw. 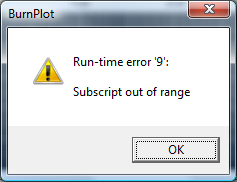 If there's any way for you to catch such errors so it doesn't cause the program to close down then that would be great. Can I also please just ask, are you delaying loading whilst the splash screen is up or is the program actually doing stuff? It seems a program as simple as this one (and I don't mean that in programming terms ) should load up instantly... and yet I find myself waiting for what's probably 2 - 4 seconds. When you save the burn plot, you need to invalidate/update the window before actually saving - otherwise you can capture the menu drop down (as I just did). It doesn't crash here - but it looks odd. However if you fake a .ibg file (such as renaming a .png file) it crashes/terminates itself. Any chance to trap that error code and instead just state something like - 'The x file is not a valid .ibg file'. The 'Open File' -> 'Browse for .ibg file to open' - would it be good to have it default to the place you ask ImgBurn to save the .ibg files? but it's not showing up on my desktop. Also - any chance to get rid of the menu drop down item/list, before the image is saved? It looks odd as it's now. I guess it won't open because there's no 'Write' data between the two markers... that's because the disc is so small and it was all cached by the drive during the 'Writing LeadIn' phase - hence no real graph data was captured. The other one probably fails because the graph entries count up to sector 612 when the media capacity says 610. That's because the disc was recorded in TAO (track at once) mode and TAO stick a couple of extra bogus sectors on the end. I guess you need to take the biggest 'sectors processed' value and compare that to the media capacity value - taking the maximum of the two as a basis for the graph. You should probably extend your new 'open file' api function and include it in the 'save file' bit for the plot picture. Default to the current users desktop too rather than the 'all users' / 'public' one. Any chance to get it to save to a .png file also as an option? I guess people are going to post the image(s) from the program in forum posts. In my example the saved .bmp file is 1314 kB - but if I convert it to .png - it's only 45 kB. The app isn't using the correct 16x16 icon by the looks of it... or at least the one displayed in the top left corner of the window and on the task bar doesn't match the real 16x16 icon within the exe itself. It must be using one of the bigger ones and shrinking it down (badly!). After you fix all the IBG reading bugs, please link your program to ComCtl32.lib and add a manifest, so that it can use styles in XP and newer. If you use some custom controls it will require some more work, but you can find all the needed info on MSDN. It's not like it will add any useful functionality, but unskinned programs just look weird these days. It works just by adding the manifest... I tried it a few days ago (using Restorator). The only visible change was the combobox though. Those buttons need sorting/changing/removing (and I mentioned this in a previous post) because the colours won't work with themes. Just adding the manifest without linking to comctl32 and initializing common controls works sometimes, but it is not recommended and in most cases the app will just crash complaining about incorrect configuration. It looks like BurnPlot will open .ibg files on Cynthia and eSkRo's systems now. Good, now I can start concentrating on form over function. Let me answer a few of your questions - yes, yes, no, yes, no, no, yes, and no. Just kidding. @ LIGHTNING UK! - 1. I think I have figured out an algorithm to calculate the RPM data but I will try the link provided to see if they have a better way. 2. Window start position = center screen. OK.
4. The splash screen is just for show. Should I eliminate it or just shorten the time out ? 5. 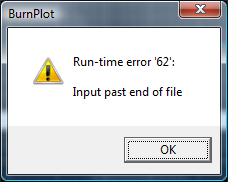 I am adding the ability to save the plot image as a .png. I will use the common dialog for saving an image which will eliminate the drop down menu problem. 6. Will fix the icon in the next go round. @ Cynthia - 1. I am not trapping any errors so people can tell me if they have an error instead of "It looks wierd". When I get BurnPlot to the point where it seems to work for everyone I will trap the errors so it doesn't bomb out on unsuspecting users. Interestingly, I tried opening a "fake" .ibg file (.png renamed to .ibg) with DVDInfoPro - the first time it trapped the error and gave me a nice message but the second time it blew up and invoked Dr. Watson for a dump which also crashed. I had to use task manager to end the process - very messy ! 2. As I mentioned to LIGHTNING UK! above I am adding the ability to save the plot image as a .png. I will use the common dialog for saving an image which will eliminate the drop down menu problem. The open and save dialogs initial directories will be ImgBurn\Graph Data Files and Current Users\Desktop respectively. @ Everyone - Again thanks for your help/suggestions. I like your new user name better than the old one and looking forward to see the next version of the program. oh just to know, this graph viewer your making, will it be built in ImgBurn eventually? No, but there will be a link for it on ImgBurn's Download page, just like there is for DVDInfoPro. I don't like to tell you to remove it but I must admit that I don't like anything which inserts an artificial pause. As your program will hopefully end up as something the users load up from within ImgBurn (by clicking the 'Display Graph Data' button), the quicker it loads the better as far as I'm concerned. Maybe you could make a nice 'About' box which has the logo, your name etc in it so you're given the credit you deserve. Remember 4.7GB discs don't exist, they're 4.37GB in true computing terms where 1024 is used for the divider rather than 1000. 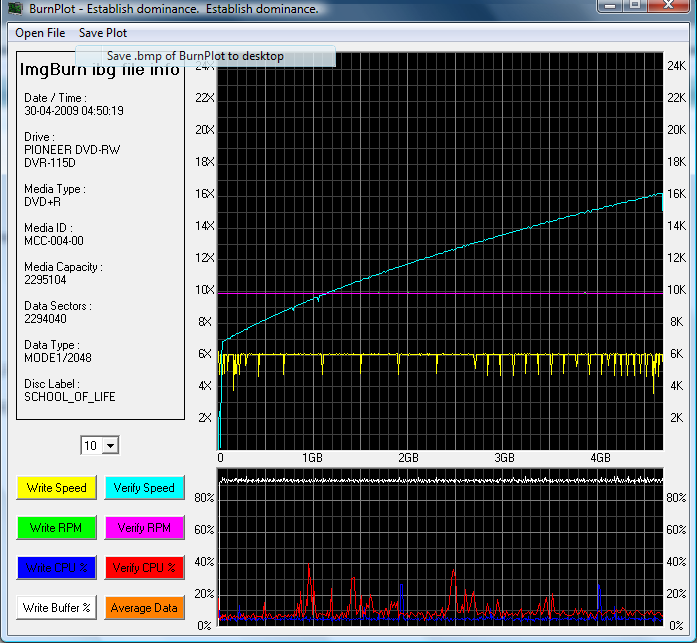 Everything is now done my end to have ImgBurn open BurnPlot or DVDInfoPro as the graph data viewer. Of course it'll only work when your tool eventually supports loading an IBG file that's passed as a command line parameter. You'll need to add that functionality so people will be able to double click an IBG file and have your program open up automatically anyway... which I assume is something you wanted? @ LIGHTNING UK! - I am still working on horizontal axis scaling, RPM data ploting, and saving the plots as a .png, but, I think I fixed the problem with opening the last .ibg you sent me (Even made a few worst case .ibg files to check it out), disabled the splash screen, and added the command line parameter functionality. Let me know if the command line parameter stuff works the way you want. Would you happen to know the 1X maximum (Sector 0) and minimum (Last sector) RPM's for CD, DVD, HD, and BD CLV drives ? I will use these values to scale the RPM calculations. @ Cynthia - Sorry about the screen name. I have been using that name since I worked in Japan several years ago. Most Americans have no idea what it means so it was kind of an inside joke. @ Everyone - Bug reports, please.